in front of the ruins of his school. 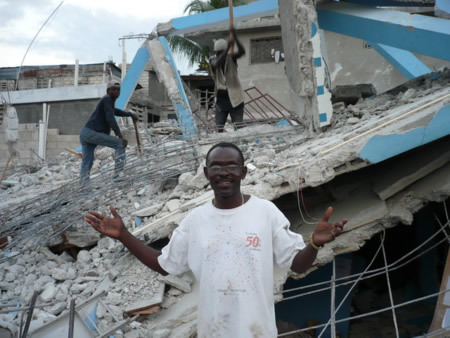 Deacon Matthew Williams, House Springs, MO - I have just returned from a week in Haiti following the disastrous earthquake on Jan 12. 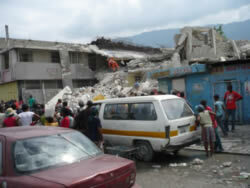 The condition of the mission in Haiti, along with the population at large, is dire beyond all imagination. While there, I visited three parishes of the Russian Orthodox Church, meeting with the faithful and assessing their needs. I travelled with a paramedic/medical officer from Belfast, Ireland (Lars Stuewe) who was able to treat approximately 50 sick and wounded, including many of our parishioners. There are so many concerns that I hardly know where to begin, but I will mention a few of the issues I believe to be most pressing. country. While provisions and medical attention are in abundance in some areas, others are reported to have received so far only 10% of what is needed. Our mission could greatly aid our parishes and the people of Haiti by addressing these needs. For example, the mission could establish food distribution networks and, especially, water purification centers. Proper sanitation also needs to be established at locations accessible to the members of our parishes. Shelter is an extreme concern that should be addressed promptly, as the general health of the population, including our own parishioners, will degrade drastically once the rainy season begins in a few months. This is especially true in Leogane, where the houses occupied by the parishioners were completely destroyed and the entire parish is living in an outdoor camp. One of the parishioners owns the parcel of land where these houses stood and where the camp is now located. If usage of this land could be obtained by the mission (by purchase or lease), an apartment building sufficient to house the entire parish could be built. I have spoken with an accomplished general contractor who is prepared to spend considerable time in Haiti overseeing this or any other construction projects. "To open a school is to close a prison". 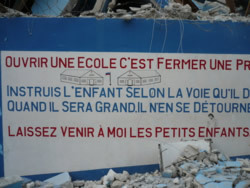 Sing on Fr.Jean's school: "To open a school is to close a prison". The school operated by Fr Jean Chenier-Dumais was completely destroyed along with his home and vehicle. I am not certain who owns this land, but if it is owned by Fr Jean or the mission, the building will need to be rebuilt. Otherwise I believe it most advisable to purchase land and rebuild the school there. In addition to the needs of Fr Jean's school, I became acquainted with the director of a school that provides a high standard of education to some 300 students. He has thus far operated the school with no outside funds, but he no longer has a building (it was destroyed) and is unable to pay the teachers' meager salaries. He was previously paying the teachers by himself taking side jobs as an interpreter. This is not an immediate need on the same level as some of the other concerns presented here, but it is my hope that the mission could take over this school's activities, thus providing critical education at a time when 90% of Port-au-Prince's schools have been destroyed. The funds needed for this project are not extreme and the benefits to the community would be great. I realize that I have raised many concerns and provided few solutions. The funds needed to properly re-establish our mission and provide for the future health is staggering, but the need is immediate. I call upon all the faithful to contribute generously to the needs of the mission and people in Haiti. Donations can be made through the Fund for Assistance to the Russian Orthodox Church Outside of Russia.